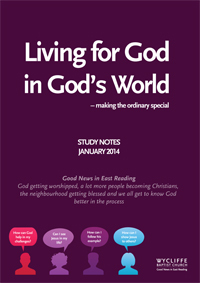 You can download our 2019 study notes here:https://www.wycliffe.church/download-the-2019-study-notes/ Or pick up a printed copy from the welcome desk in the Kings Room. “Want to join a Wycliffe team on the “Love Moldova” Village Outreach with OM? You can now sign up to make your interest known. Please visit: www.uk.om.org/om-item-short/gb/en/g4705Contact Roman (rzischka@gmail.com) for more information. A one year course starting in October 2018 and running through to Summer 2019. All ages are welcome but it will be geared towards people in their 20s and 30s. Please contact the church office for more information and to book your place – they’re filling up fast!